This amazing route will amaze everyone who wishes to have a balanced mix of active and relaxing summer holidays filled with unforgettable memories, beautiful destinations. nature, cities, and islands. Get ready to be amazed by continuous beauty, amazing food, never-ending activities and ultimately relaxing and having the best cruise experience! Located on the Turkish coast, the city of Bodrum is one of the must-visit destinations that offers a unique mix of traditional. Modern and the cultural. To sum it up, here you will find everything you might need and want, which makes this town one of the best starting points for gulet cruise. Boarding starts at 16:00 from Bodrum Harbour where you will be welcomed by our representative who will meet you with your crew. On this first day, your yacht will remain anchored in modern Bodrum Port for deluxe fine dinner and stay at the port an overnight until next departure in the morning. However, you might be ready for some action right away so for that we suggest you go on the stroll around the town. Bodrum has many unspoiled areas, but the most eye-catching is Bodrum Castle built in the 15th century! Even if you decide not to explore it you can still enjoy in the view on it since it is visible from many points. After your breakfast, you will departure to gorgeous Orak Island. Once you arrive and finish breakfast there you will have an opportunity to swim in the crystal clear waters. This is also a good time to unwind on a yacht with a glass of wine, enjoy in a jacuzzi, read a book, or simply get a bit of sunkissed tan. For those who are ready for some action right away, we recommend testing out watersports available on a yacht. No matter what you choose after a while, you will get hungry, but your professional crew and passionate Chef will amaze you with a full table of amazing food for lunch. After pleasurable lunch, you’ll head to Cokertme, a small and picturesque fishing town, for dinner and an overnight stay. If the weather conditions allow it and your gulet is suitable it may be possible to use the sail on the way. When gulet is anchored and secured you and your group are welcome to take a short walk on the shore while dinner is being prepared on board. Before breakfast, your Captain will lead you to the Seven Islands. Get ready for another outstanding day in the Seven Islands Region full of activities. This region has many small islands and beautiful coral reefs. What we recommend is that you go diving, swimming, but also you may just relax, sleep and resting under the shade away from direct. Later on land, you can enjoy in a walk around the forest out of pine trees. Our first stop in Seven Islands Region will be Kufre Bay, and your yacht will anchor at Uzun Liman (Long Port) where you can enjoy in watersports or any activities you prefer. Afterward, we will cruise to the English Port for dinner with a romantic sunset in the background. It’s safe to say you will be secured for relaxin overnight stay. An interesting fact is a name English Port comes from the time of 2nd World War as the ships of British Navy forces used to dock here. 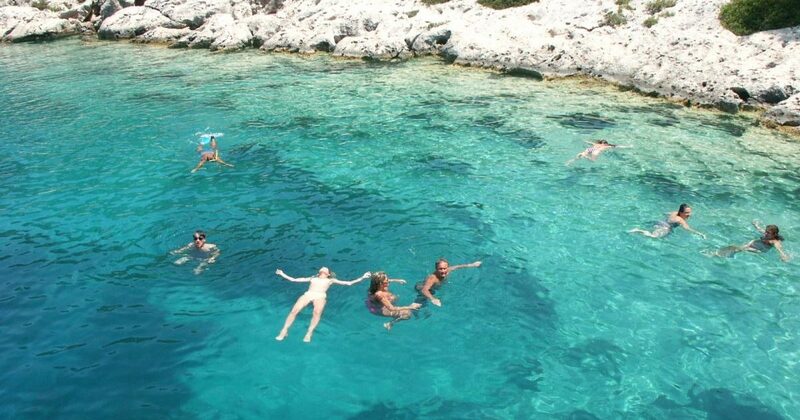 On Tuesday you will visit Sedir (Cedrae) Island also known by the name Cleopatra Island. This very unique island with many more private beaches that are quite small but have unbelievable clear water. After a morning on the beach, explore the city walls, the temple. amphitheater and many other historical buildings od your interest. After sort of historic tour head to Cleopatra Beach because it has a very unique exquisite kind of sand that can only be found in the deserts of Northern Africa! There is a myth that King Antonius brought the sand from Egypt via sea for Cleopatra to impress her. After a fun day, you will sail to Karacasöğüt village for a nice dinner in a relaxing atmosphere and spend the night there. This lovely village is only 25 km away from Marmaris so it is possible to visit Marmaris via ’dolmus’ (minibusses). We can also organize an optional tour to Dalyan – Caunos if you request it in advance. Get ready to be amazed by continuous beauty after morning swimming and amazing breakfast full of fresh food and good coffee that probably by now became your ritual. Here in Longoz, you can enjoy endless blues of the ocean and any water sports activities. For lunch, your captain will cruise to Longoz Bay which is like a paradise on earth, protected with majestic pine forests and preserved nature. After a tasty lunch, you can enjoy a short walk in the forest and take a rest in Ali Baba’s local shed-like cafe or stroll around and explore the scenery. 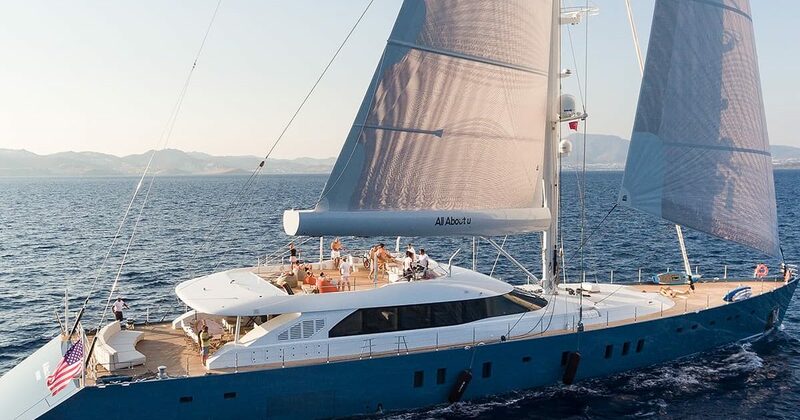 Afterward, the gulet will be anchoring at Tuzla Bay for swimming break in the turquoise waters. As the day goes by your personal Chef will provide you with dinner on board that is absolutely mouthwatering. Overnight stay will also here so you can relax and rest in peace and tranquillity. Discover Kargili Bay (Molla Ibrahim Bay) early in the morning where you can enjoy in tasty breakfast. Later on, you can again spend a day on a gorgeous beach and completely unwind with no worries and stress on your mind. We recommend you to enjoy some water sports available on your yacht. After the whole morning spends on the beach you simply get hungry. But when you get on board Chef will wait on you with the most amazing food that is not only pleasing to the taste but to the eye as well. After lunch, you will be anchoring at Kisebuku (Alakisla Buku). Here you can see and further explore the ruins, visit local cafes and restaurants and enjoy in the local atmosphere. You will spend the night here and hopefully have a super nice sleep. Another great day and actually the last full day for unwinding, relaxation and taking it easy before heading back home. First stop of the day will be Kisebuku named by theByzantine monasteries found in the region. When the temperatures get high, head to the sandy beach with crystal clear sea to seek refreshment. There are plenty of attractions that you should visit while you are here, also some historic ones like Byzantines ruins. After you’ll head to Pabuc Burnu to enjoy lunch there made by your Chef. Expect only the freshest local quality food that will surprise you with quality and taste. After lunch and optional swim break in the early afternoon, you will head to Yaliciftlik Bay where you can enjoy an afternoon tea and snack on something. 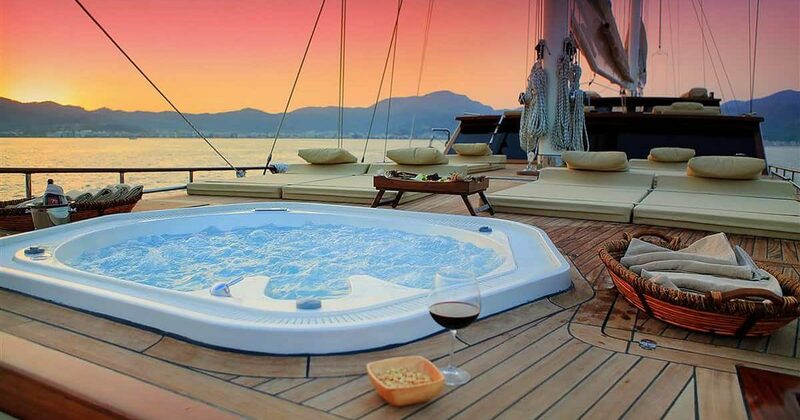 As the sun starts to go down your yacht will cruise back to Bodrum Port for the last dinner and an overnight stay. You will have to leave the yacht with valuable memories by 10:00 after breakfast. If you want you can later before heading home further explore the Bodrum. Before you check-out, a representative will come for one last visit on board to check how everything went and if you need any further assistance (transfers, suggestions on how to spend the day till your flight and similar).